So you other parents of multiple young children, do you experience the constant bickering too? Like it’s bad around these parts some days. If you weren’t a frequent flier, you might actually worry about me and the state of my household. The reality is that I have very active, very vocal kids- and let’s be honest some days after many many corrections I lose my ish and resort to yelling. Happens to the best of parents. Bless my neighbors, who have thankfully done their time as well and know the drill. They fight over so many things. Who knew dinner ingredients would ever be one of those things. Not me! And yet they did. They still do, lol. So I’m always keeping that in mind, and trying to come up with ways to keep meals simple. Quick and easy for my sanity, but also with ingredients nobody can find a reason to complain about. There’s really nothing in this dish my guys can complain about- now at least. The youngest son could spot a minced piece of chicken, dissect, and spit it out until he was almost four. The second son, well he was just plain ol’ picky until around 9 years old when he finally realized food actually tastes good. By food I mean things other than hot dogs, mac and cheese, fruity pebbles, and spaghetti with meatballs. Thank the good Lord those days are behind me. Pretty sure they’re responsible for many of my current gray hairs. Nowadays, as I mentioned- all the sons are pretty amenable. I like to throw it back sometimes though with some of the first meals I found that worked. Especially ones I know they loved and that bring back fond memories even now. 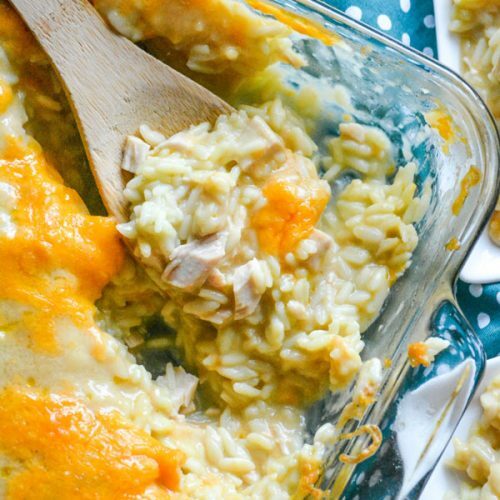 This chicken rice pilaf casserole will forever hold a special place in my heart as the first real meal everybody dug into, without a single complaint. From anyone. It was a momentous occasion, for sure. It also led to this being a regular on our monthly menu for years to come. It didn’t hurt that it was and is a very easy, budget friendly recipe. We all could use more of those in our lives, too! 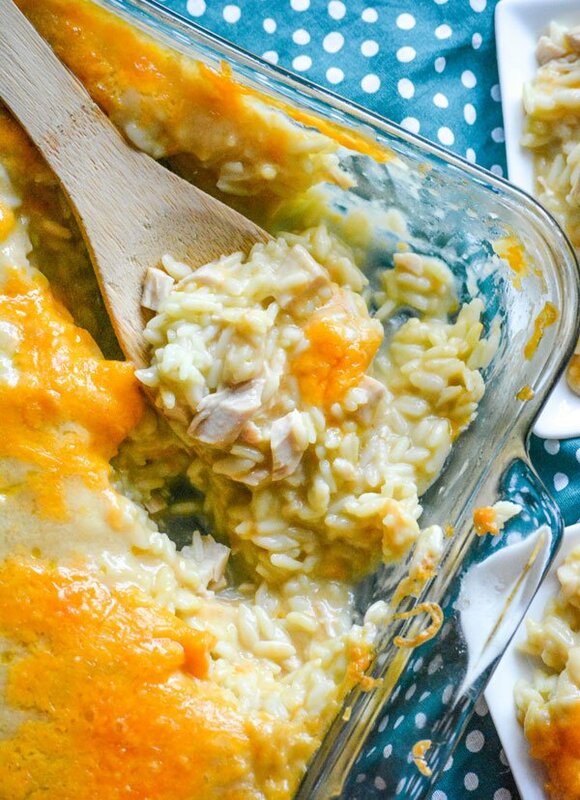 Dinner just doesn’t get any better than this 5 ingredient Chicken Rice Pilaf Casserole. It’s simple. It’s savory. It’s seriously so good. Did I mention how easy it is? 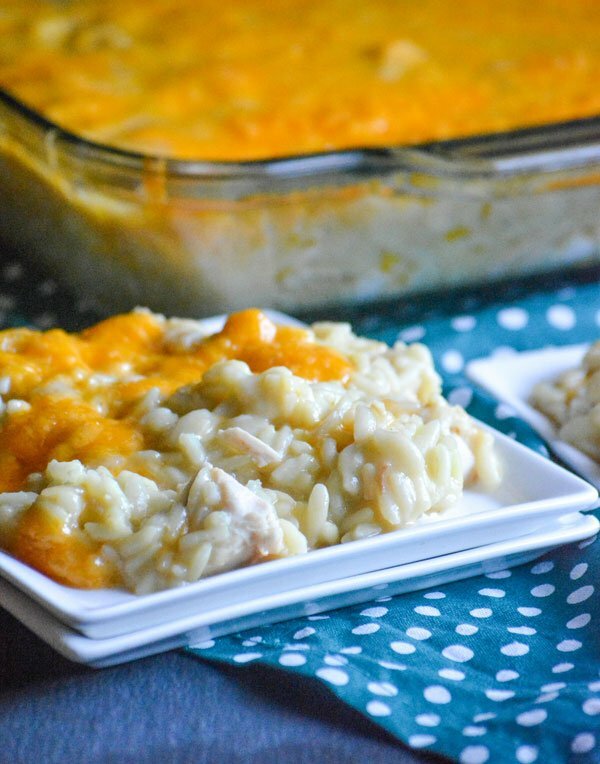 I can throw this casserole together in about 10 minutes, pop it in the oven, and have a hot dinner dish ready in just over 30 minutes. That’s priceless to me on busy days- weeknights or weekends. To begin, lightly grease a 9×13″ baking dish with non stick cooking spray. Then spread your chopped, cooked chicken evenly out over the bottom. With my gaggle of kids to feed, I opt for using more chicken- but that part’s totally up to you. Cook the Rice A Roni according to the package directions, but stop it when the rice is 3/4’s of the way cooked through and there’s still liquid in the pan. The rice will continue cooking, and the liquid will cook out in the oven. We don’t want it to get dry. 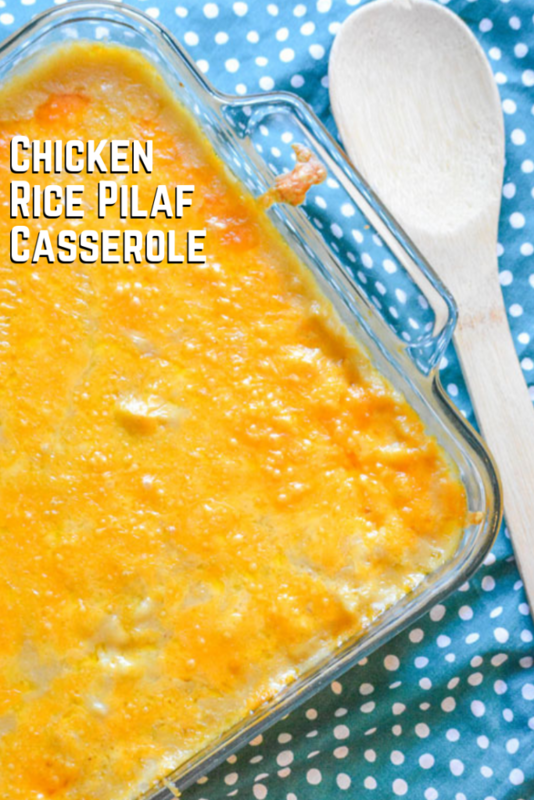 Pour the rice pilaf into the casserole dish, and spread it out evenly. In a medium sized mixing bowl, add both the can of cream of chicken soup and the gravy. Stir together until evenly incorporated. Pour this onto the rice, and spread it evenly out over top. 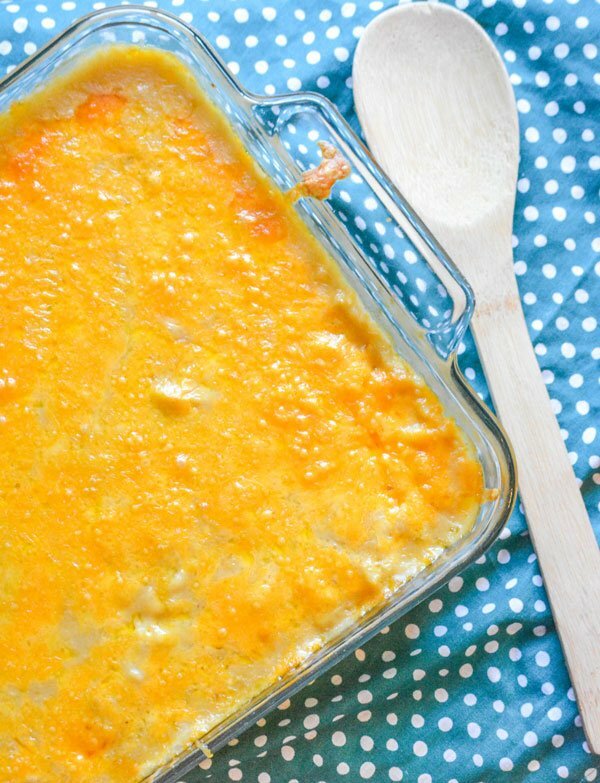 Sprinkle the shredded cheddar out over the dish, and then bake at 350 degrees for 25-30 minutes. You want golden melted cheese that has formed a delicious crust. 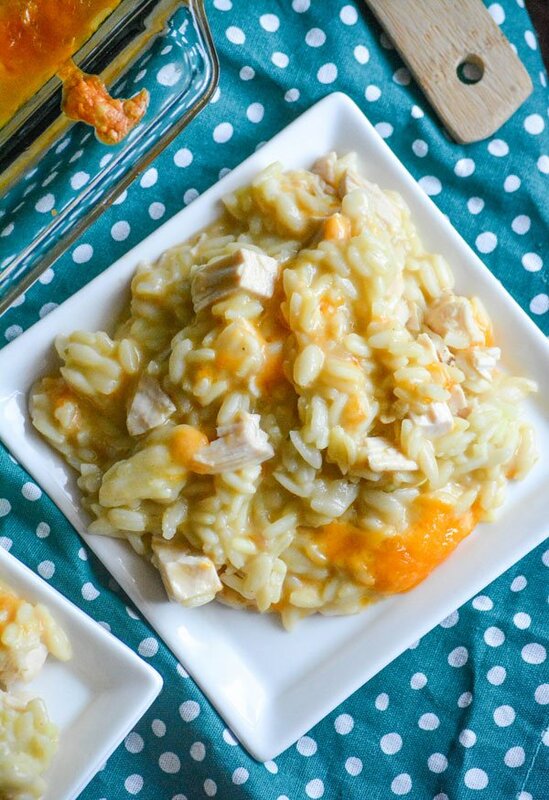 Every bite is Heaven, and your family may try to fork each other over those crusty cheese bits. Just giving a friendly warning! 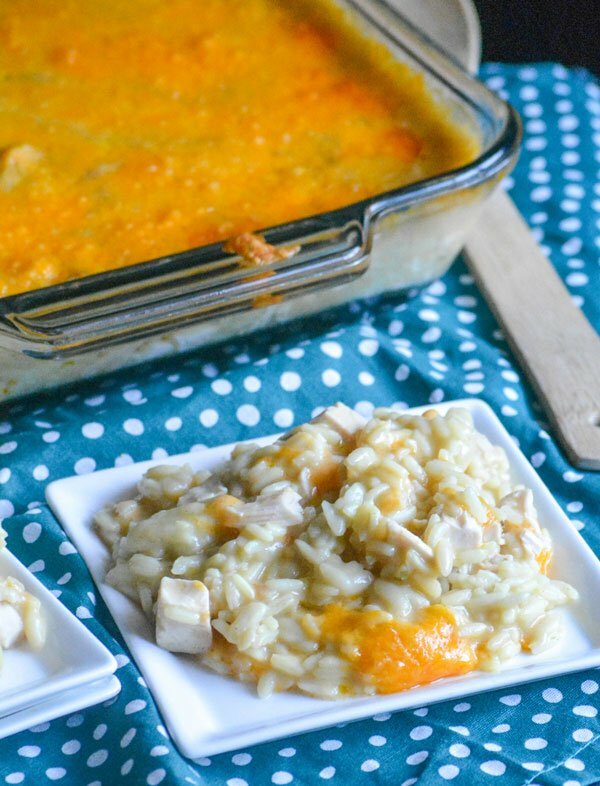 If you’re looking for a simple ingredient dinner that can be ready in one episode of Peppa The Pig, then this Chicken Rice Pilaf Casserole is the thing for you. I mean on top of it being flavorful, amazing, and using easily stocked ingredients & all. 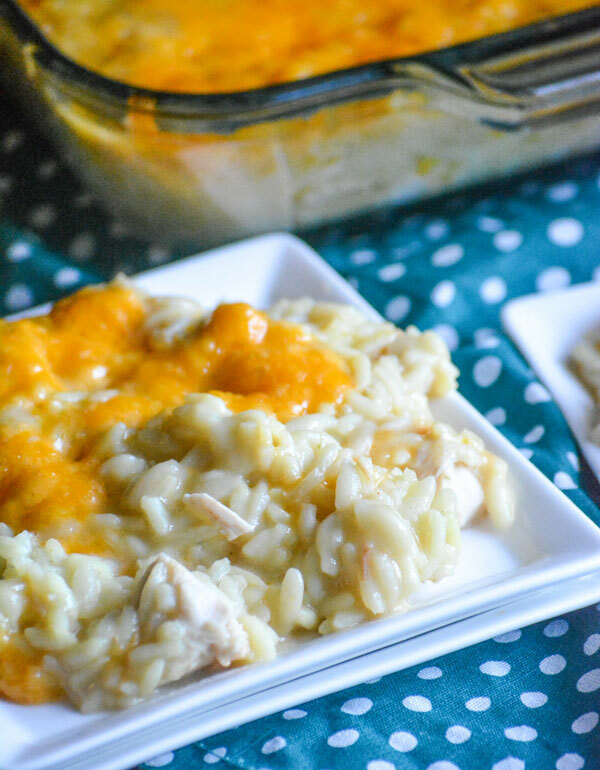 A creamy chicken and rice casserole, this one's made easy using rotisserie chicken & convenient boxes of rice a roni- all topped with a delectable cheese crust. Spread the chicken evenly out into a 9x13 inch baking dish. Set aside. Cook the boxes of rice a roni together, according to the package directions- stirring occasionally. Remove the skillet from heat when the rice has cooked 3/4's of the way through, and there's still broth left in with it. Spoon the rice mixture evenly out over top of the chicken, spreading as necessary for an even layer. In a small mixing bowl, whisk together the cream of soup and the gravy until evenly combined. Pour & spread this evenly out over the rice layer. Sprinkle the cheese evenly out over top. Bake the casserole at 350 degrees for 25-30 minutes, or until hot and bubbly and the cheese has begun to form a golden brown crust. Remove the dish from the oven, and let it rest for 2-3 minutes before serving so it can 'set'.